Once you catch the crochet virus , it’s hard to come by without a complete crochet hook set! With a crochet hook set you’ll have all your hooks neatly organised and you’ll be able to create any crochet work you fancy. We offer high quality crochet hook kits, both for ‘regular’ crocheting and for fine thread or lace crocheting. All our crochet hook sets are ergonomically shaped, for hours and hours of pain-free crocheting. One of the most popular -and certainly most colourful- crochet hook sets: the Clover Amour set. Ranging in size from 2.0 to 6.0mm, all 9 of these ergonomic crochet hooks have a soft, rounded handle with a comfort grip, including a flattened part on which your thumb can rest while crocheting. The grip is comfortable for different styles of crocheting, whether you hold your hook like a knife are like a pen. The cheerful colour coding is one of the many benefits of the Clover Amour complete crochet hook set: you’ll be able to recognize the sizes very quickly. Also, the heads of the hooks are slightly pointed, making it easy to insert your hook into (tight) stitches. 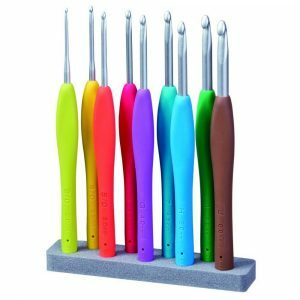 According to its fans, this complete crochet hook set by Tulip is the most comfortable crochet hook kit on the market. One of the reasons for this is the cushion grip, which enables you to crochet away for hours without getting tired or sore. Like Clover Amour, these hooks also have an ergonomically flattened thumb rest. The head of the crochet hook is very smooth and semi-blunt, to help you insert your hook into stitches and prevent splitting the yarn. The hooks range in size from 2.0 to 6.5mm and come in a pretty pink carrying case with a cute tassel. A nice bonus on the Tulip Etimo Rose set is a gold-plated embroidery scissor and two darning needles. Whether the Etimo Rose or the Clover set is best for you is very personal and depends on your method of crocheting. When in doubt, we recommended trying one of each brand before ordering a complete crochet hook set. This beautiful crochet hook kit consists of 10 Tulip Etimo Soft Grip Steel crochet hooks in the sizes 0.90mm, 1.0mm, 1.25mm, 1.5mm, 1.75mm, 2.0mm, 2.20m, 2.5mm, 3.0mm and 3.5mm. These are steel hooks or ‘thread hooks’, used for delicate crocheting with fine thread. 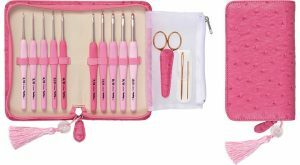 The hooks have the same comfort and design as the regular Etimo Rose crochet hook set, come in the convenient pink carrying case and are also complemented with a gold-plated embroidery scissor and two darning needles.